Chaos reveals his new G4 form as the last card of the day of the year. 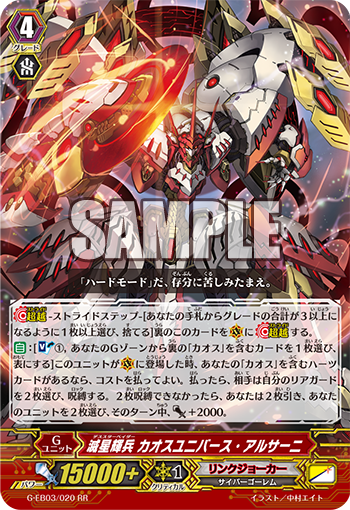 AUTO [Soul Blast 1, choose a G unit with “Chaos” in its name from your G zone, and turn it face up] When this unit is placed on (VC), if you have a heart card with “Chaos” in its name, you may pay the cost. If you do, your opponent chooses 2 of his or her rear-guards, and locks them. If your opponent could not lock 2 cards, draw 2 cards, choose 2 of your units, and they get Power+2000 until the end of the turn.